Every 3 seconds, someone in the world develops dementia. Here in New Zealand, 4 out of 5 Kiwis are affected by dementia. The impact of dementia on Kiwi families and whānau is growing each year, and affects people of all ages. 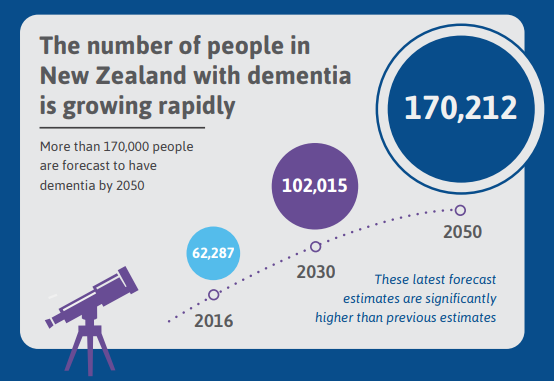 Dementia is one New Zealand’s most significant and growing health challenges, with almost 70,000 Kiwis currently living with the condition. That number is set to increase to around 170,000 by 2050 as our population continues to age. And of course, that is just the tip of the iceberg. For every one of those people there are family/whānau and friends also affected by the diagnosis. Dementia also has a significant economic impact, costing around $1.7 billion in 2016 and, if we do nothing, we expect that to rocket to nearly $5 billion a year by 2050. And we are not alone. With the number of people living with dementia around the world set to double every 20 years, it is a global issue that also demands a global solution. In 2017 the World Health Organization member states, including New Zealand, adopted the Global Action Plan for the Public Health Response to Dementia. Sadly, New Zealand is currently doing a poor job of meeting the expectations of the Global Action Plan, with only one of the seven Action Plan areas showing any significant progress. Too often the services and support people with dementia in New Zealand need to live their best possible life are not available – services are provided inconsistently across the country and are of variable quality. Despite the fact that the New Zealand Framework for Dementia Care already provides a blueprint for doing more and better for people living with dementia, five years on implementation of the Framework has barely started. New Zealand simply cannot afford to do nothing about this critical issue. Government needs to act urgently to address the looming dementia challenge. Our view is that the first step must be to invest in fully implementing the New Zealand Framework for Dementia Care. Without real change the human and fiscal cost of dementia will just continue to grow. There is much that we can do, too, to build an open, inclusive and Dementia Friendly New Zealand – one where people with dementia feel valued and safe, where they can contribute to and participate in their communities and where they get the help and support they need. September is World Alzheimers Month, a global campaign united in its call to raise awareness and challenge the stigma associated with dementia. It is a time of action, but it’s also a time of reflection for the millions of people around the world, both young and old, who are affected by dementia. If we are serious about building a Dementia Friendly NZ, it will require all of us to do our bit to support people living with dementia to live well and play a meaningful role in their communities. As a society, there is much more we can all do, and with almost 70,000 people already living with dementia in NZ today, there is no time like the present to start. Find out more about how to get involved at http://www.alzheimers.org.nz/.